The holy Trinity Church, which was built in mid-11th century, has maintained its uniqueness throughout hundreds of years. 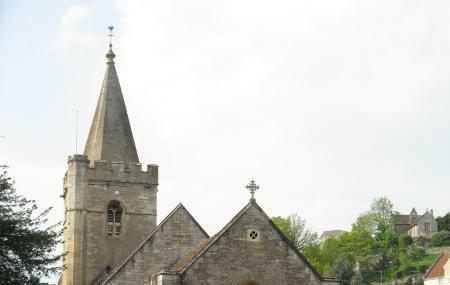 You can be on your spiritual journey or can be exploring historic side of Bradford-on-Avon, Holy Trinity Church always has something to offer to everyone. You can still find the tombs from 14th century. The refurbishment of this church took place in 2016 and that has made it even more stunning. Located near the town centre by the river, this church should be on top of your list. Find the joy in planning a D.I.Y. trip by using this awesome Bradford-on-avon trip planner. Hotels like Old Mill Hotel & Lodge, Benson House Box, Bailbrook House Hotel - A Hand Picked Hotel and Homewood Park Hotel And Spa will solve your problem of where to stay in Bradford-on-avon. Create your own Bradford-on-avon vacation packages or choose from the ones made by travel experts. Also explore the best ways for how to reach Bradford-on-avon. Love this? Explore the entire list of places to visit in Bradford-on-avon before you plan your trip. Fancy a good night's sleep after a tiring day? Check out where to stay in Bradford-on-avon and book an accommodation of your choice. A beautiful light and airy church. Fascinated to see two ancestors named on the WW1 memorial plaques. A very warm and inviting Church. Well worth a visit. When you walk inside the door on a Friday afternoon how nice to hear a Blues group having a great time. This church certainly has the Wow factor. Do have a look.